Human IL-1 RAcP, His Tag (ILP-H5225) is expressed from human 293 cells (HEK293). It contains AA Ser 21 - Glu 359 (Accession # Q9NPH3). 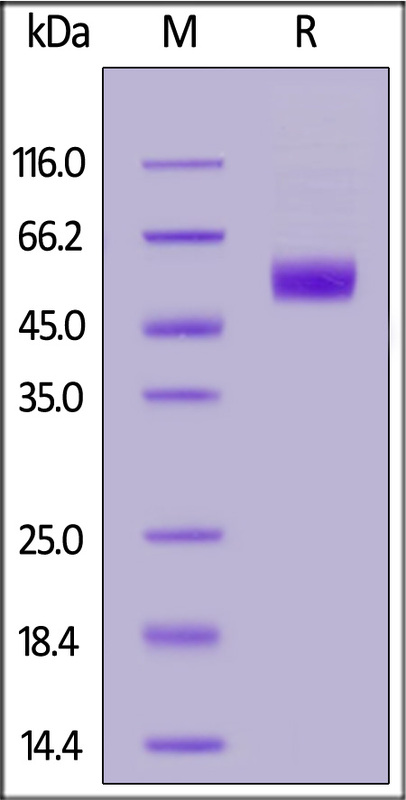 The protein has a calculated MW of 40 kDa. The protein migrates as 50-60 kDa under reducing (R) condition (SDS-PAGE) due to glycosylation. Human IL-1 RAcP, His Tag on SDS-PAGE under reducing (R) condition. The gel was stained overnight with Coomassie Blue. The purity of the protein is greater than 95%. Interleukin-1 receptor accessory protein (IL1RAP or IL-1RAcP) is also known as Interleukin-1 receptor 3 (IL-1R-3 or IL-1R3), C3orf13, which belongs to the interleukin-1 receptor family. IL1RAP contains three Ig-like C2-type (immunoglobulin-like) domains and one TIR domain. IL1RAP is detected in liver, skin, placenta, thymus and lung. IL-1R3 / IL1RAP is coreceptor with IL1R1, associates with IL1R1 bound to IL1B to form the high affinity interleukin-1 receptor complex which mediates interleukin-1-dependent activation of NF-kappa-B and other pathways. (1) Huang J., et al., 1997, Proc. Natl. Acad. Sci. U.S.A. 94:12829-12832. (2) Jensen L.E., et al., 2000, J. Immunol. 164:5277-5286. (3) Smith D.E., et al., 2003, Immunity 18:87-96.